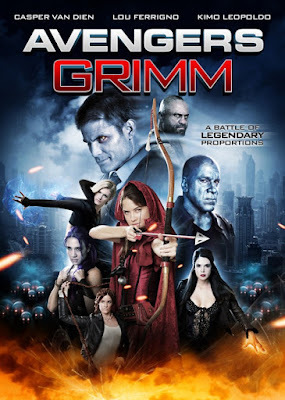 AVENGERS GRIMM deals with a group of fairy tale princesses (Cinderella and Rapunzel among them) who travel to modern day Earth via a magic mirror in an effort to stop Rumpelstiltskin (Casper Van Dien) from taking over the world with his army of zombies. This superturd mess is currently available for streaming on VUDU, Amazon Instant Video, and YouTube, but as always, you're better off rewatching any one of the Marvel flicks (including IRON MAN 2) and leave the Cinematic Turd avenging to us. Our special guests this time out include a (first ever!) all male panel of dudes, including Paul "The Cinematic Hawk" Hawkins from BlokeBusters podcast, Arthur Harkness from the Brotherhood of Evil Geeks, and Degenerate John from the Steel Cage Radio podcast.